Atlantis Investment Management was founded in London in 1994 by three star ex-Schroders fund managers. Ms Yang Liu, now Atlantis’ Chairperson and Chief Investment Officer, joined Atlantis in 2002 as a Fund Manager. As Yang grew to become one of the most recognized names in China investing, she acquired the Atlantis group in 2009. Under Yang’s direction, Atlantis’ center of gravity has shifted to China. Our headquarters is now in Hong Kong, where we occupy the 35th floor of the Centrium skyscraper high above the Central district. Our two main investment focuses, China and Asia ex-Japan, are operated independently and led by our dedicated portfolio managers. 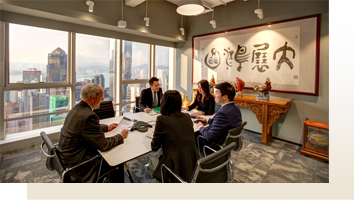 While the non-investment functions (risk management, legal and compliance, trading, operations, marketing and investor relations) are provided from Hong Kong, our investment and research professionals are based regionally in Asia – Hong Kong, Shanghai and Singapore. This enables our investment professionals to focus on what they do best and provide us our key advantages: local, street-level intelligence. Atlantis currently offers a wide range of services for global institutional investors through the Atlantis funds and via segregated mandates. The first of these is our Western heritage. Atlantis’ earliest investors were British royalty. Our ties to Europe run deep, are in our DNA and are permanently a part of who we are. Also built into our chromosomes is the legacy of our English co-founders, who were literally among the inventors of modern wealth management. Atlantis Investment Management has been independent and 100% owner-managed since our founding, helping us avoid conflicts of interest. This means Atlantis can perform our own independent research, offer investment services to our clients without the entanglements of the global firms and accomplish what is best for our clients. Even though the two main strategies are led by different portfolio managers, our research analysts work in collaboration. We believe that through continuous discussion and teamwork, experience and knowledge can be shared and enhanced. Since Atlantis’ beginnings, clients’ interests have always been our top priority in order for us to build and maintain long-lasting partnerships with our clients over time. The alignment of interests of investors, Atlantis and its employees is the key to success while upholding the highest ethical standards and integrity. Thus, trust is developed and merited. While Atlantis is a boutique, we have devoted significant resources to institutionalize our infrastructure with the systems required of an asset manager that has served global institutions such as pension funds, foundations and endowments, sovereign wealth funds, insurance companies, financial institutions and other institutions. Our teams are staffed in-house for risk management, legal and compliance, equity trading, operations, marketing and investor relations as well as corporate functions such as finance, information technology and human resources. Atlantis launches systematic strategies funds dedicated to identify and exploit investment opportunities by means of a mathematically modelled approach.